I’ve now fitted an FSA Vero crankset to the Brompton, removing the outer ring and adding a 3.2mm of washer spacing (2mm + 1.2mm from SJS Cycles) between the spider and the inner 34-tooth chainring to move the latter a little closer in. I used the original chainring bolts and now have a front chainline of about 43mm. At first, I tried the FSA crankset, that has a JIS square taper, on the original Brompton bottom bracket, which uses an ISO square taper axle. The chainline was out at 50mm or so. 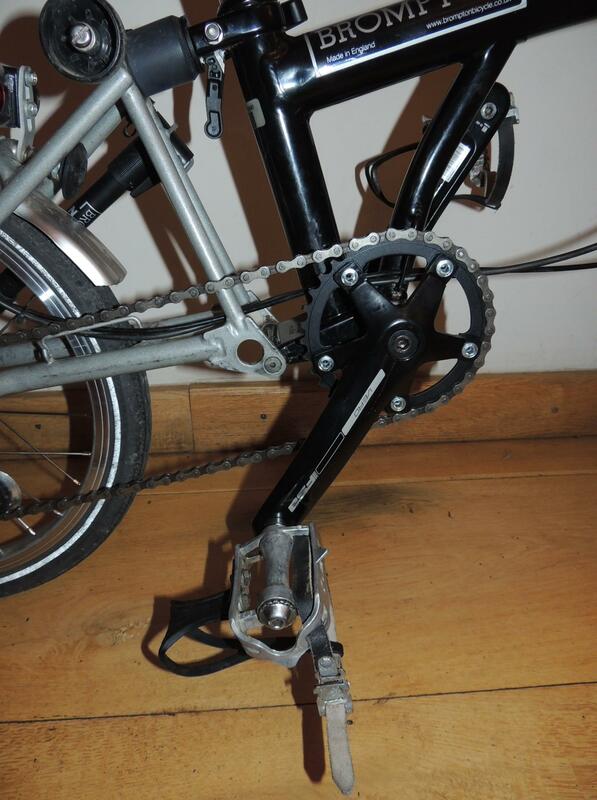 I decided that for the modest cost involved it would be better to change the 119mm Brompton bottom bracket (not sure who makes it) for a 118mm Shimano one with JIS taper. It was easy to change and the Shimano BB allows a much greater choice of cranksets, including those designed for single speed set-ups. The FSA chainring clears the rear triangle by about 2 – 3mm when folding the bike, so I could probably move it in another mm or two to improve the chainline marginally. The original 100-link chain for the 6-speed Brompton, which I retained intact to use with the 33-tooth Sturmey crankset supplied by Kinetics, works fine with the new 34-tooth FSA one too. Despite around 4mm difference between the front and back chainlines, there is no noticeable chain noise and everything feels very smooth. 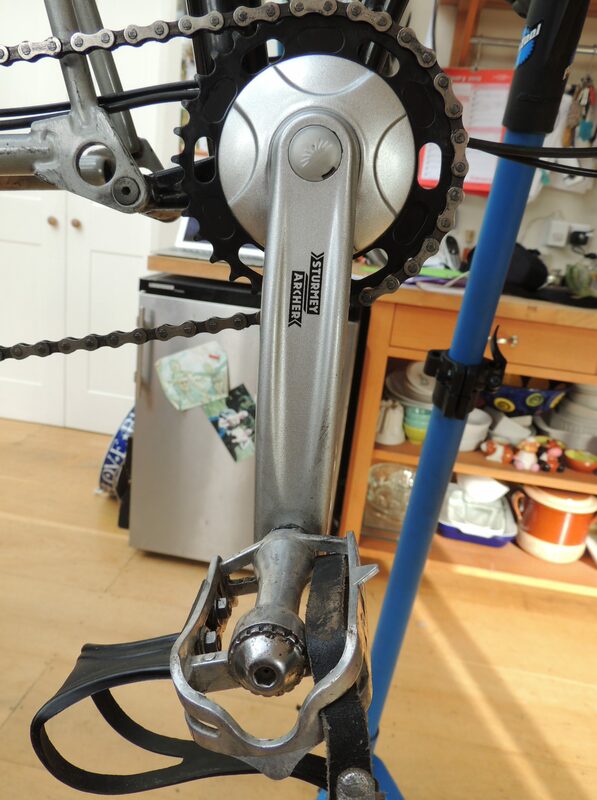 The crankset looks much smarter, the chainring is replaceable, the chainline is adjustable by adding or removing washers under the chainring bolts (either side), and I have a great choice of chainrings if I want to adjust the gearing in future. You can buy chainrings with anything from 33 to 50 teeth that will work with this 110mm BCD crankset. In fact, I think I discovered a chainring with just 30 teeth while researching what to fit to my Brompton, but I haven’t been able to find it again, so maybe I was imagining it! Onto the handlebars…my next target for customisation.